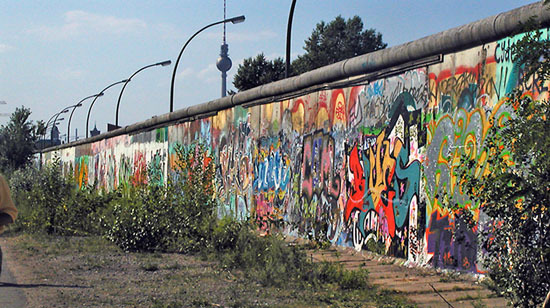 Mikhail Gorbachev did bring about the tearing down of the Berlin Wall, a portion of which is pictured here, in 1989. Read the textbook chapter 42. Check the remarks by Professor Blois and Professor Evans on Gorbachev. Read Gorbachev on 1989 by Katrina vanden Heuvel and Stephen Cohen from The Nation (16 November 2009). For 50 points maximum extra credit, watch Malenkaia Vera (Little Vera) and, in a one-page paper, assess the accuracy of the film's portrayal of Soviet society in the 1980s. For 50 points maximum extra credit, watch Moscow on the Hudson and, in a one-page paper, assess the accuracy of the film's portrayal of the Russian experience. For 50 points maximum extra credit, read Andrei Amalrik, Will the Soviet Union Survive until 1984? (1971) and write a one-page paper in which you assess the accuracy of Amalrik's ideas. For 50 points maximum extra credit, read Mikhail Gorbachev, Perestroika: New Thinking for Our Country and the World (1987) and write a one-page paper explaining the main points of Gorbachev's policy of perestroika. For 50 points maximum extra credit, read Lech Walesa, The Struggle and the Triumph: An Autobiography (1992), not a Russian but an important political figure, and write a one-page paper explaining the success of the Solidarity Movement. For 50 points maximum extra credit, read Alla Yaroshinskaya, Chernobyl: The Forbidden Truth (1995) and write a one-page paper explaining what went wrong at Chernobyl. For 50 points maximum extra credit, read Anatolii Rybakov, Children of the Arbat (1987) and write a one-page paper about the author's portrayal of the legacy of Stalinism.